Organization, access and privacy – the triumvirate of the information professional. But now, let’s see how it works. 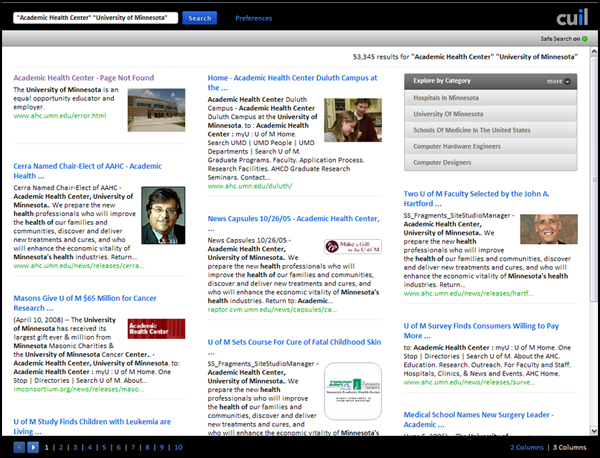 The search for Academic Health Center University of Minnesota (without quotes) sometimes brings up the AHC home page as the first result (as it should) and at other times, it isn’t even listed. A common variation on this search uses quotes to ensure inclusion so let’s try “Academic Health Center University of Minnesota.” No results were found. That seems a bit drastic. A different variation using “Academic Health Center” “University of Minnesota” does produce results, including the AHC home page, but occassionally the first result presented is the AHC’s dreaded 404 file not found page. For comparison, the above three searches on Google consistently provides the AHC home page as the first result each and every time. Let’s give it one last try with the simple search AHC History Project (without quotes). No direct results on the first page. In Google, this blog is number one. As for the images associated with the search results, some are obvious, others are not even found on the page that is returned, meaning Cuil is just grabbing anything out of an image folder on the server. Consistency during Cuil’s first week seems to be its biggest deficit. Search engines do get better over time and I may eventually be won over, but for now, Cuil, is not so cool.